Why is it that some service business owners, freelancers and independent professionals charge (and receive) much higher fees than others? Is it their expertise and professionalism? Is it their education and track record? Is it the value they offer? Or it is a combination of all of these? And is there a secret to charging more? A good friend of mine, Patrick Summar, is a professional coach who works primarily with entrepreneurs. Most coaches charge about $300 to $500 per month for coaching. Patrick charges most of his clients $1500; he just got his first $3000 client. >> RELATED: Pricing Business Services: How Much Should I Charge? What miracles does Patrick deliver that enables him to charge five to ten times more than the average coach? Patrick is a good case study; I think you can apply his value pricing approach to your situation as well, whether you’re a coach, consultant or other service professional. He sells a solution, not a process. He realizes people are not buying coaching, they are buying an outcome; they want to use coaching to get something they are not able to achieve on their own. So in his initial conversations with potential clients, he spends a lot of time exploring desired outcomes. What outcomes are important to your clients? He sees his fee in relationship to the outcome. If a client can increase his or her income by more than $1500 per month, they’ve at least broken even. But he looks at that as only a starting point. He knows that, through his coaching, a client will make certain changes in their life and business that will result in short and long-term value that dramatically exceeds his fees. What’s the real value of your services? He adds a lot of intangible value. Patrick always comes to a coaching call prepared. He gives the client a structure to extract maximum value from every session. He has systems and teaching tools that help the client build new skills. And he’ll do things such as send his clients books or other materials that support and inspire. What value can you add to your process? He has the guts to ask for more. Remember that the client will never voluntarily suggest that you raise your fees! You tend to get what you ask for. Patrick looked at what he thought he was worth and decided to ask for it. As simple as that. He feels he’s worth it. He knows his service pays for itself. And he knows the long-term value of his coaching will pay off for years to come. So he asks for more and gets it. Are you willing to ask for more? The first and most important thing for you to realize is that you can charge higher fees. 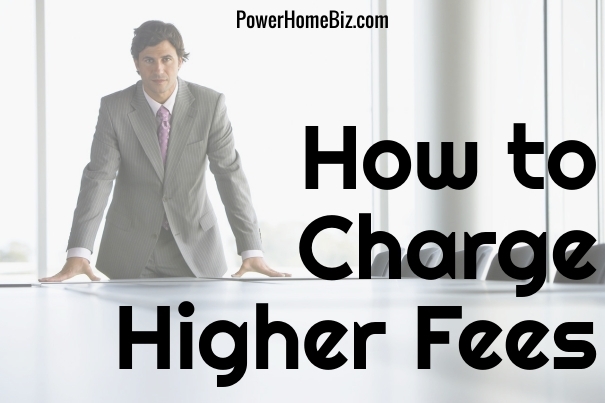 You can charge fees based on the value a client receives, not based on time spent. The second thing to realize is that there are clients who will willingly pay what you’re worth, if you package your services accordingly. It’s not usual, however, that professionals consistently undervalue their services. In fact they are often quite unaware of the true value they bring to the table. Instead, they set their fees based on what most others in their profession charge (not enough). If you charge this way, you’re no better than a commodity. When you start to think value, everything changes (as it did with Patrick). Then clients start to see you as a valuable investment that will help them achieve their most important outcomes. That’s quite a shift in perception. It can be scary to change the way you charge for your services. What if nobody will work with you anymore? What specific things can you do to increase your value? How can you make this change as soon as possible without making major mistakes on the way? And how can you shift your view of yourself so that you value the contribution you’re making and feel justified in charging for it? You are worth more than you’re charging, in many cases a lot more. You can dramatically increase your income if you commit to pricing your services based on value, not time. It takes guts; but it can change your business and your lifestyle faster than any other business strategy.